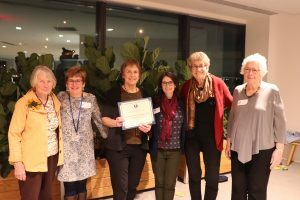 L-R: Mary Smoyer, BWHT Board; Gretchen Grozier, BBF docent/editor for content to BBF format; Michelle Jenney, BWHT Board President; Samantha Nelson, BBF Executive Director; Libba Ingram, BWHT Board; Katherine Dibble, BWHT Board/ Editor of BWHT content. 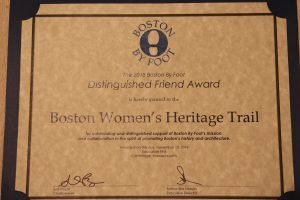 Boston by Foot honored Boston Women’s Heritage Trail with their “Distinguished Friend of 2018” award, presented at their “Annual Awards Reception” on November 13, 2018. L-R: Samantha Nelson, Boston by Foot Executive Director and Michelle Jenney, Boston Women’s Heritage Trail Board President. 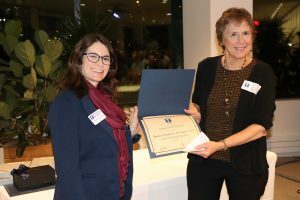 With the partnership, Boston Women’s Heritage Trail shared the research and content of our Beacon Hill trail to enable Boston by Foot (BBF) to create the “Notable Women of Beacon Hill” tour. The tour was run three times during the BBF season and met with much success. Our partnership is ongoing, and we look forward to working with BBF so that additional BWHT trails become BBF tours in the coming years. Check out the Boston by Foot website!